Uncomfortable Plot Summary: A man suffers from existential angst. First Sentence: The World is what it is; men who are nothing, who allow themselves to become nothing, have no place in it. This gap is obviously something that really needs to be remedied, and probably not just for me. But where Bryce Courtenay's The Power of One gave me an appetite for Africa, A Bend in the River made me lose it. And yeah, no more metaphors now. I really did not like this book at all. Just at the point when I should've been getting into it, I was wishing it was over. I'm afraid the summary is going to reveal how little attention I bothered to pay to this book. The story is Salim's (not Saleem's though, unfortunately). His family, Muslim Indian transplants on the east coast of Africa, have made the continent their home for centuries. When colonialism starts to, for lack of a better word, dissipate, Salim knows that things are going to get desperate, so he buys a store in the heart of the continent from a family friend named Nazruddin. I'd name drop some countries, but unfortunately Naipaul doesn't name any names. Colonials have already been driven out of the town where Salim's store is located, and he and all the other local non-Africans begin to pick up the pieces, while the Africans in the villages around them begin to adapt to the new domestic rule and the continent's changing place in the modern world. This is actually a pretty interesting premise. In retrospect, more than anything else, it makes me curious about an alternate history of North America involving Vikings, the Chinese, and the forceful ejection of French and English settlers. But that's just the weird way my brain works. (And after reading the first volume of Company of Adventurers, I must say I'm surprised that the continent itself didn't manage to "forcefully eject" those wimps.) But the idea is interesting in its own setting, too. 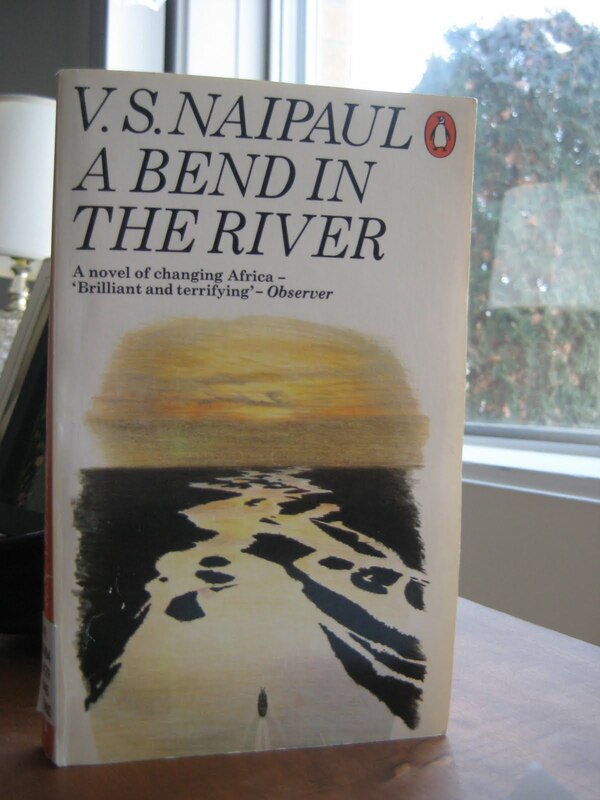 However, while Naipaul does very gently brush the surface of some of this, it was through the eyes of a character that I didn't care about at all. While he didn't inspire the hatred that Sebastian Dangerfield did, Salim was certainly no match for Saleem. And whereas Loving was probably about as boring as A Bend in the River, Naipaul is far inferior to Green when it comes to characterization. I found both the style and the story here incredibly tedious. Everybody is forever giving grandiose speeches, and it grates. I think it's probably obvious by now that I favour simple or at least straightforward language, and Naipaul's style was rarely either one of those things. A House for Mr. Biswas, another of Naipaul's books, is at 72 on The List, and I seriously hope that that one is better than this one. I didn't want to go back. Not the first time. I didn't think my heart could stand it. But the aeroplane is a wonderful thing. You are still in one place when you arrive at the other. The aeroplane is faster than the heart. You arrive quickly and you leave quickly. You don't grieve too much. With each job description I read I felt a tightening of what I must call my soul. I found myself growing false to myself, acting to myself, convincing myself of my rightness for whatever was being described. And this is where I suppose life ends for most people, who stiffen in the attitudes they adopt to make themselves suitable for the jobs and lives that other people have laid out for them.